So you've read our blog post about using email in your marketing, and have decided to go for it. But before you grab a long list of email addresses and start hitting send, you need to consider spam. We've all had it. 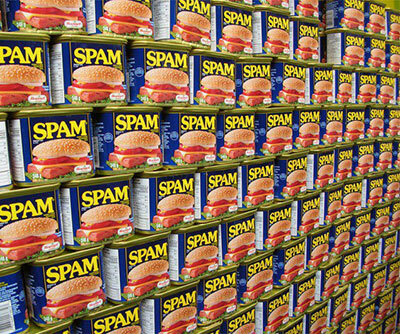 Spam is basically electronic junk mail. It's defined as an unsolicited email, i.e. one that the recipient did not ask to receive. How can I avoid sending it? Make sure your list of email addresses is clean and up to date. If you get a high bounce-back rate you might be marked as a spam sender. Don't use 'blitz' or 'spray and pray' approach. Segment your recipients and make sure your messages are targeted correctly, i.e. what you are sending is actually of interest to that segment. Add an Unsubscribe link. This is a legal requirement. Don't bombard your contacts, or they'll get bored of you and unsubscribe. Avoid multiple exclamation marks, coloured fonts, all capitals and 'spam trigger words'. Check out our list below. Obviously some of these words are common business phrases so it's hard to avoid them. We suggest that if you must use one of these phrases, just use it once per email otherwise it could be blocked. Try to use synonyms like 'complimentary' instead of 'free', or change the wording slightly so you don't get picked up by spam filters. A good way to deal with these issues is to use a a web-based email marketing service like MailChimp or Mailigen. These services are free up to a certain level, so are great for small businesses who want to give email marketing a try. If email marketing sounds a bit too daunting, drop us a line and we'll see if we can help.